They were too old, slow, and broken to be reused by even the poorest person. Better laptops than my two old guys get regularly thrown or given away for free. Not even the upgrade parts which I add to them are useful anymore. I seem to have to add more RAM to every computer I buy, those were no exception, but old RAM doesn't fit new computers, and so it has to go, too. I investigated may ways. Bringing them to an Umsonstladen (shop without money, to donate things to people in need). Giving them to Labdoo to help children in the third world. Putting up a free auction or ad on ebay. Bringing them to a refurbishing shop. But nothing would change, that the two laptops are just too broken to be used and too old for the components to be used. Anybody who needs an old laptop can probably get a better one for free. So I checked at Berlin's public garbage company and indeed, they take on all electronics "for recycling". I imagined that maybe the devices are shipped back to China where some underpaid children disassemble them and all the little parts and materials go to an appropriate facility that needs them. 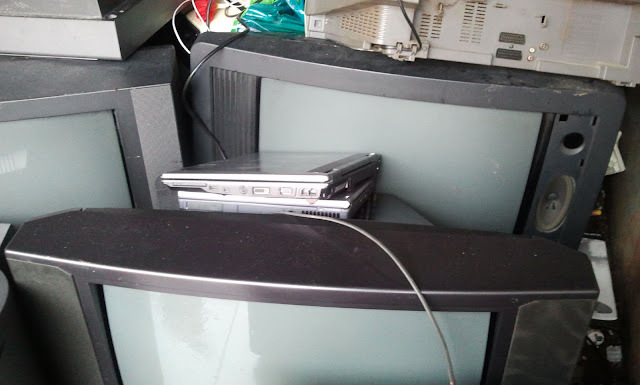 I went to the BSR Recycling point and all there was were huge containers, including one with all kinds of different electronics, as you can see on the picture with my good old friends sitting in between. Only cell phones were separated and went into a large bin. I asked what'll happen to the container and the facility employee just said: "It's all gonna be shredded and to rediscover the base metals." Ah, *sigh*. In that case, I could have spared all the effort of erasing my data. Taking out the hard drive and throwing it out from the highest floor of the house, before taking it to "recycling" would have been enough. Well, in any case, both computers served me well. They really had to work a long time with daily use and lots of typing until some keys had already started failing. If this is the best way for them to die, let it be. They have earned their final rest. As for all my research into data cleaning and how to give laptops away for free, maybe it helps one of my readers or it'll help me in case that my next computers won't serve me until their death. I experienced some drama preparing two old laptops for recycling. If you just want to know my lessons learned about permanent data deletion, skip to the end. My aim way to remove my data in a permanent way without destroying the value of the hard disks for re-use or re-cycling. Both laptops ran Ubuntu and by a friend I had heard of tools like "shred" and "wipe" which overwrite files before deleting them so that they can't be recovered. Both tools protect against the use of ordinary recovery software as well as advanced forensics. For the former, overwriting once with zeros or anything else is sufficient as anyone with basic knowledge about file-systems knows. For the latter, overwriting many times with zeros, ones, and random patters is considered sufficient according to what the tool makers say. I don't know of any tool which easily reverses formatting or repartitioning, but I know how easy it was to recover almost all my data from a broken disk which wouldn't boot the computer any more. Since repartitioning and formatting also usually only changes some sectors of the disk, but leaves most of the disk intact, it is quite similar to a partly broken disk. In practice, installing a fresh OS on the repartitioned disk could disable most of the easy recovery tools, but since I didn't plan on installing anything, I didn't think about how safe this road is. If your external drive is slow or the live-distro you're booting has trouble with drivers, don't even bother to boot into graphical mode. Instead find the option to boot into a terminal and use it. run "dd if=/dev/zero of=/dev/hda conv=noerror" replacing "hda" with your actual device name. I added the "conv=noerror" to ignore write errors so that it continues overwriting everything that still works. It would be too bad if the process stopped because of one bad block in the middle and I had to redo it or --even worse-- wouldn't notice it at all! As usual in the Unix world, there's no fancy message telling you all's done and well. So you have to know yourself, that this is, in fact, the happy end. Remove all data partitions and the swap partition from /etc/fstab. Run "swapoff -a" and "umount /datapartitions". if you still have data and temporary files on the remaining (OS) partition, delete it with "rm". that's the hardest part, because it requires deciding where there could be private data that has to be deleted and where's the OS files that are still required. finally, do "dd if=/dev/zero of=/remaining_partition/bigbigfile" for each remaining partition. Again, no happy end message, but that's it. I found that dd into a file is actually faster than dd into a partition (just my laptops, YMMV), but I find that overwriting the entire partition is safer, because the file-system-internal areas (directories, journals, whatever modern stuff) also contain some private data. That's why I usually take care to have separate data partitions. Also for backups and stuff.